Hi DEEP family! We have an announcement to make. Lost Desert had a last minute delay with his US visa processing and he is no longer able to perform at “City Lights” tomorrow. We look forward to announcing a new date with Lost Desert very soon! You know the party don’t stop and the show must go on! Needless to say, we have booked another “DREAMY” artist to perform in his place😉 Because we aren’t kidding around, SHE must play this gig unannounced. However, we can promise that you can put your trust in us full force on this one! We can’t wait for a great night with our VERY SPECIAL SURPRISE GUEST & Marques Wyatt!!! 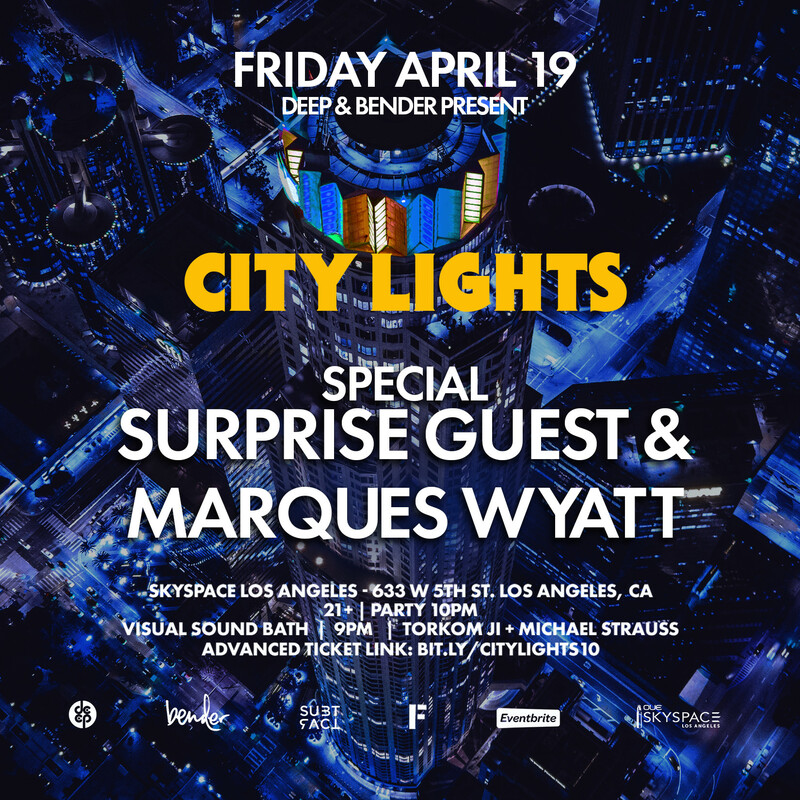 DEEP Los Angeles x BENDER Present “City Lights” at Skyspace Los Angeles… It’s the dance party in the clouds, where we SHINE & groove 1,000 feet above a sea of lights! ~ Dance floor sound by Subtract Music x Danley Sound Labs, Inc.
–> EARLY ARRIVAL is highly recommended — due to security check and elevator ride, it can take 15+ minutes to reach event space from lobby. –> Doors open for party at 945pm. No new entries after 1am. –> This is a 100% non-smoking venue (inc. vapes). To smoke, guests must visit ground floor and exit building (expedited re-entry is available). –> Tickets are transferrable and nonrefundable (i.e. if you cannot attend the event, you may sell or give your tickets to another person // or receive a credit useable for a future Bender event).